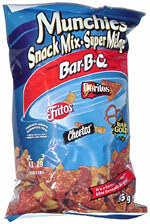 Taste test: This snack mix includes miniature Smokey Red BBQ Doritos, plus Bar-B-Q Fritos, Cheetos and Rold Gold pretzels. It's a nice combination, and they taste pretty good. I've never seen the miniature size Doritos anywhere except in this bag. The barbecue taste is not that strong, though, with the two non-barbecue tastes mixed in. The pretzels all sunk to the bottom of the bag, so we had to dig down to even get one. 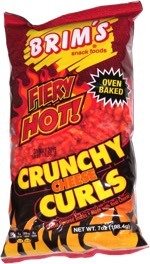 Smell test: Smells like corn chips.